Economic growth, rising affluence and a growing world population have been the major contributors to the environmental crisis we now face. Witness for instance our ever-escalating global greenhouse gas emissions. 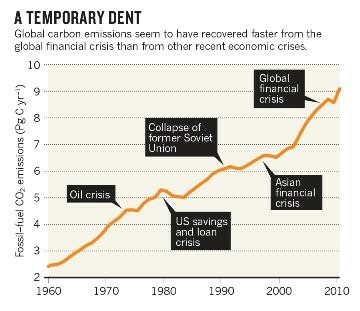 Despite four decades of political discussion about the urgency of climate change, the only times we have been able to halt this inexorable rise has been during periods of economic recession, such as our recent global financial crisis. Compound economic growth lies at the heart of our material impacts on the planet which can no longer be ignored; climate change, ocean acidification, species extinctions, the depletion of the phosphorus and nitrogen cycles. And yet politicians and economists unanimously promote economic growth as the ultimate measure of success and the most worthy of objectives. To even question the benefits of increasing Gross Domestic Product (GDP) is tantamount to treason in this age of economic rationalism. Of course there have been those who have challenged this growth fetishism. Most notably in the early 1970s, the Club of Rome emphasised the tangible problems underlying ever-increasing economic growth, most notably in their ground-breaking book The Limits to Growth. Despite the rejection of such arguments by mainstream economists and conservative commentators, those early 1970s predictions are holding up very well indeed. Moreover, there are alternatives. One is the ‘steady state economy’, an economy which does not exceed ecological limits ‘with stable (or mildly fluctuating) levels of population, consumption, and therefore GDP’ (Czech, 2013: 119). Pioneered by ecological economists such as Herman Daly, such a vision entails the human economy fitting within the ecological limits of Earth’s ecosystems and a more equitable distribution of wealth within national and global economies. Of course to achieve such a vision would involve significant economic change, and advocates acknowledge that implementing such a steady-state economy would necessarily involve the ‘degrowth’ of already wealthy nations; an outcome that is likely to be politically unpalatable. While noble goals, the advocacy of a steady-state economy is less clear on how such an agenda can be implemented in an era in which economic growth is seen as one of the most critical measures of political success. Indeed, even for many proponents of climate action the idea that responding to the climate crisis might involve challenging economic growth is steadfastly rejected. So the recent study The New Climate Economy by the Global Commission on Economy and Climate, an elite group of senior politicians, businesspeople and economists, was widely received as evidence that responding to climate change need not upset the economic growth model. Indeed, economist Paul Krugman argued the report showed that: ‘strong measures to limit carbon emissions would have hardly any negative effect on economic growth, and might actually lead to faster growth.’ Critics responded that while significant reductions in carbon emissions can result from carbon pricing and the deployment of renewable technologies at scale, little consideration has been given to the quantum and pace of reductions required to avoid dangerous levels of climate change. For instance, Kevin Anderson from the Tyndall Centre for Climate Change Research has sought to quantify the economic change required to limit global warming to the political agreed maximum of 2 degrees Celsius this century. Based on a defined budget of carbon emissions, his calculations suggest industrialised nations would need to reduce their emissions by over 10 per cent per annum immediately. As he and Alice Bows argue, this level of emissions reduction has never been achieved and ‘are not compatible with economic growth’ (Anderson and Bows, 2011: 40). This would require ‘degrowth’ of a kind greater than was seen during the collapse of the former Eastern Bloc economies in the early 1990s. Indeed, as Tim Jackson has pointed out, to maintain economic growth and reduce emissions sufficient to keep within the 2 degree limit would require an absolute decoupling of GDP from CO2 emissions, something we have never come close to achieving despite significant improvements in energy efficiency. Calculations by auditing firm PricewaterhouseCoopers for instance, suggest that the global economy would need to reduce its carbon intensity by 6.2 per cent per annum (five times faster than the current rate) till 2100 to keep within the 2 degree limit. Indeed, others argue that collapse of some form is now inevitable and that creative self-destruction will result in a dramatic correction of human folly. In this narrative, it is now too late to avoid the significant consequences of our belief that we are beyond nature. Examples of this catastrophic narrative include computer scientist Stephen Emmott’s Ten Billion (2013), science historian Naomi Oreskes’ fictional account of the future in The Decline of Western Civilisation (Oreskes and Conway, 2014), and evolutionary biologist Guy McPherson’s Going Dark (2013). Here the concept of ‘near-term extinction’ and ‘human die-back’ is seen as an inescapable outcome of climate disruptions playing out over coming decades. Even ‘optimistic’ variants of this genre which foresee a rejuvenation of human civilisation from the ashes of collapse, acknowledge massive human mortality as the unavoidable outcome of our current economic path. Hence, Paul Gilding (2011: 53) in envisaging The Great Disruption notes that: ‘…in the geopolitical, economic, and climate chaos involved I expect we’ll tragically lose a few billion people’. This is all a long way from the pumped up optimism and economic delusions evident at the G20 talks. Unfortunately, the next decade is likely to present us with some very unpalatable truths regarding the conflict between a habitable environment and our addiction to economic growth. We can’t say we haven’t been warned! A revised version of this post was published in The Conversation. Previous PostThe Biodiversity Crisis: Video of Sydney Ideas LectureNext PostWhat Use is Social Science in Understanding the Climate Crisis? Very nice! Reblogged on http://garryrogers.com. In my opinion, economic growth cannot last much longer. We are about to hit the wall, as the ‘surplus energy’ we have enjoyed from high ERoEI fossil fuels throughout the 20th Century are replaced with low to very low ERoEI ones, which are themselves used to manufacture so called renewables whose ERoEI is even worse…! I’m sure none of this will even cross the minds of J Hockey and T Abbott. I agree with Mike Stasse. Economic growth will stop. The question is, will it do so as a disastrous collapse, or in a coordinated, compassionate way? Sadly, I expect the former. The 2008 collapse was “solved” through a trick. Governments created money with nothing to back it. As long as people were willing to trade goods and services for this imaginary money, things could recover. But now, global debt exceeds the total value of goods and services available. How long can such an illusion last?